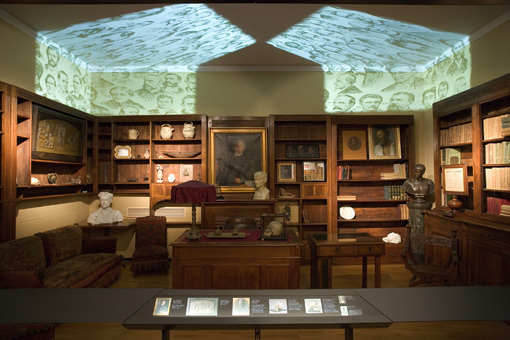 List of Countries » Italy » Turin and its Province » Museo di Antropologia Criminale "Cesare Lombroso"
Cesare Lombroso was engaged along his whole life in the search for evidence of criminal acts and behaviours. 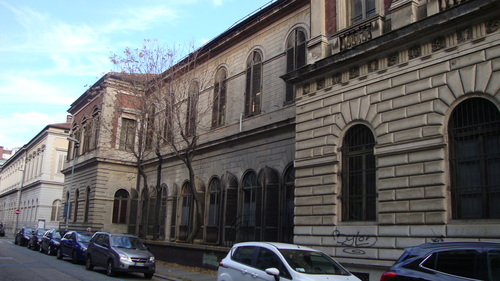 The Museum of Anthropological Criminology “Cesare Lombroso” in Turin (Via Pietro Giuria, 15) focuses on the criminal individual in his psychological and biological characteristics. Its goals are to draw general laws in order to comprehend every criminal event. 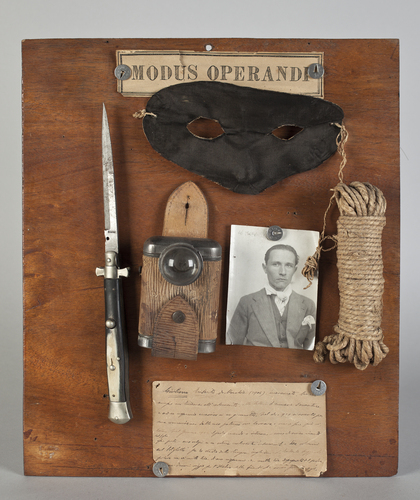 It holds just a small fraction of what was found in prisons by Lombroso himself and his collaborators. However, the Museum owns multiple playing cards, molds in clay, vases, drinking glasses, messages from prisoners, dates, declarations of innocence and much more belonging to madmen and criminals. Along its history the museum was closed and reopened several times. "Lombroso was a born collector - as he walked in cities, in the countryside, in courts, in prisons, he was always looking for something that no one else saw, collecting and piling up a great deal of information, of which there and then no one - not even him sometimes - could tell the value but they linked to some study of his"1. In 1884, at the opening of the first Congress of Criminal Anthropology at the National Exhibition of Turin, he displayed the first nucleus of his collection. In the following year a new Congress was held in Rome. Encouraged by the positive outcome of these first two exhibitions he successfully attempted to open the Museum. The office of Cesare Lombroso was donated to the Museum by his son in law and collaborator, Mario Carrara. 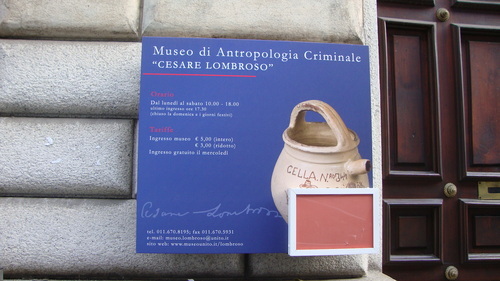 In the frame of Lombroso's portrait a colored inscription indicates the main topics on which the Criminologist and Anthropologist focused his studies on: "Genius, Madness, Murder, Pellagra". On the desk lays the skull of thief Vilella2. This tool is one of the few scientific devices left in the Museum. 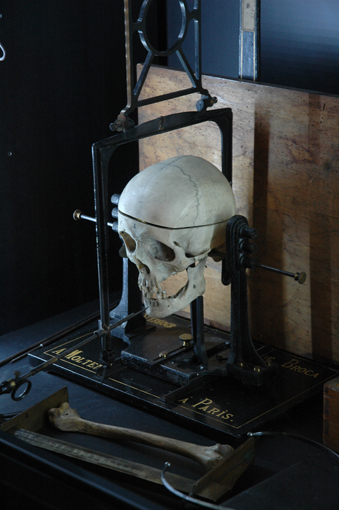 Along with the “Craniografo Anfosso”, this tool was used by Lombroso for criminals’ cranial measurements - which were of vital importance both for the founding of Lombroso's theory on the criminal anomaly and for the identification of delinquents by the police forensic department3. "Deliquent doesn't belong to a psychological or sociological category. It belongs to an organic category. The psychological traits are the consequences of organic conditions, so you can often guess the moral fiber of a person by the appearance of their skull4". In Lombroso’s theories, psychical features were considered a direct consequence of organic modifications; therefore by measuring the skull or analyzing the physiology police and doctors could guess criminals’ behaviors. Physical differences – such as the harelip - were pointed out as a factor that distinguished such individuals from the “mass” and made the person carrying it exceptional. These types of features were referred to as “decay features”. For this reason, Lombroso claimed that criminals could be recognized thanks to “decay features”. In addition, Lombroso studied mental diseases and claimed that mental diseases were transmitted from father to son. 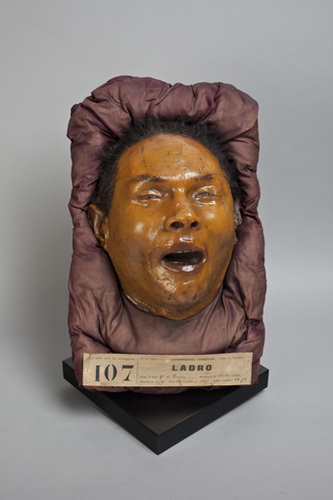 These death masks were manufactured by the Institute of Human Anatomy of the University of Parma directed by Lorenzo Tenchini, a friend of Cesare Lombroso. 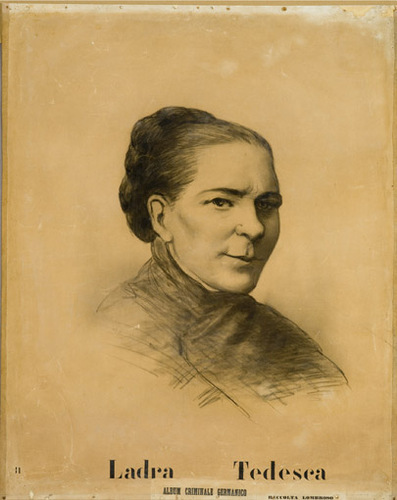 They portrait delinquents who died while incarcerated. 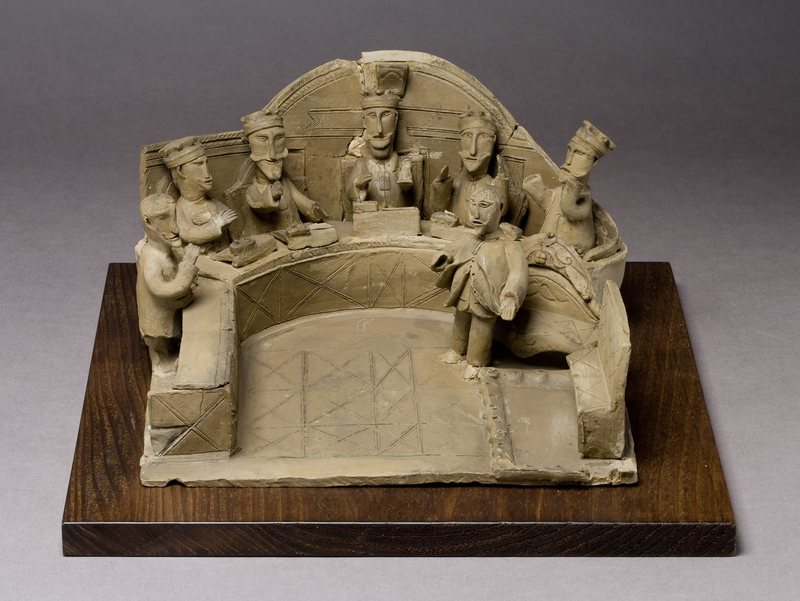 The masks made in plaster were later covered with wax and displayed on small silk pillows. In the original exhibition, these were accompanied by the skull and brain of the criminal. However nowadays this part of the collection is in a grave condition of deterioration5. The molds of hands and ears of psychiatric patients were made by Luigi Frigerio. 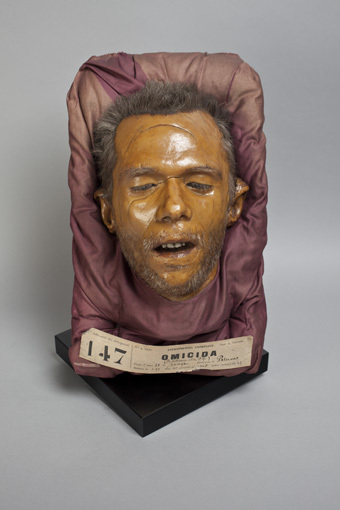 They were produced in order to prove that there were real differences in anatomical parts of delinquents and/or patients. These tables containing ears and hands in plaster were first displayed at the First Criminal Anthropology Congress in (Rome, 1885). All of the anatomical parts collected from thieves, murderers and psychiatric patients were studied to discover atypical characteristics in this type of people. "The people and even the scientific world believe that the prison, especially the cell, is a paralysing entity. But since no decree, supported with force, can go against the nature of things, this organization speaks, moves and sometimes injures and kills in spite of all the decrees; except that, as it always happens when a human need is in conflict with a law, it is carried on along the less known and hidden better pathways…"6. Cesare Lombroso gathered a great number of statues in clay throughout the years. 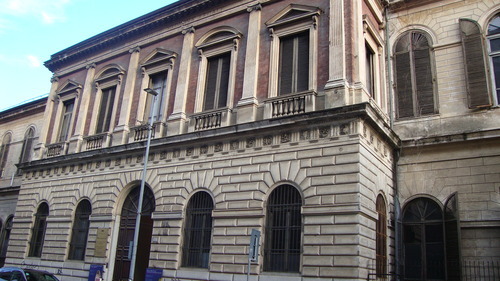 The portrayal of the Court of Justice is a work made by a prisoner whose identity is unknown, maybe La Porta. These sculptures were manufactured by prisoners who tried to remember and boast about the crime they committed. The miniature is 30x30 cm and is missing a few of its original pieces. It is believed to date back to 18997. "One cannot be struck by the words "I am happy" when they clash with the natural sadness of their condition, which are repeated after having written: "Abandon all hope, you who enter here." And you can explain the strange analgesy (indifference to pain), that they could ascertain with the tools we have in physiology; but especially for the law enforcement that we are always in great passions8". The vases collected by Cesare Lombroso during his various studies depict the life of criminals in prison. 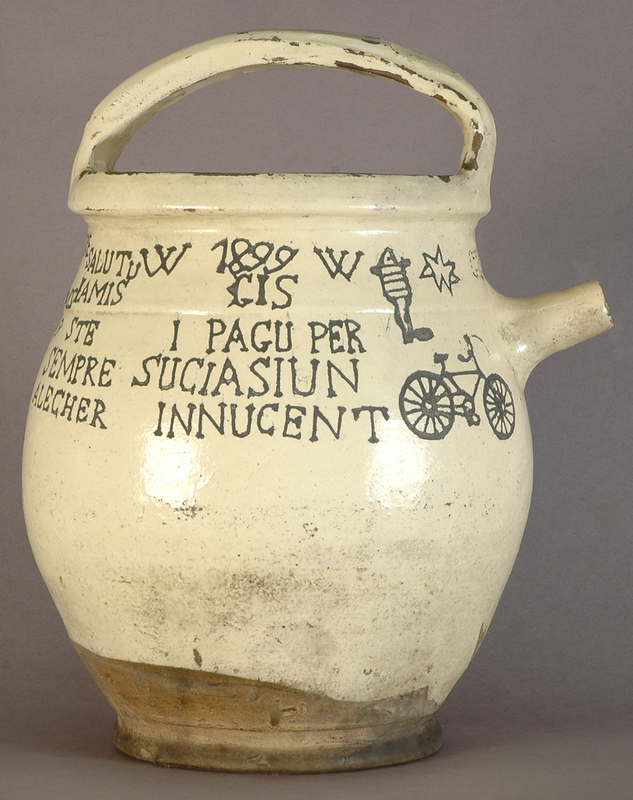 The number of cell, figures and captions are frequently depicted on the vases – which were used to hold the prisoner’s waste products. According to Cesare Lombroso’s theories, the use of both writing and drawings draws back to a primitive state of mind. "As the giants of the stature pay the penalty of their greatness with infertility and with its intellectual weakness and muscle, so the giants of genius pay the penalty of their intellectual power with degeneration and madness.The phenomenon works in two directions: insanity genes and mad genius. The same violence, irresistibility, and intermittent access confirms the genius be a psychosis degenerative epileptic group. Moral-epilepsy genius-epilepsy are welded in the same block already identified in the criminal type9. 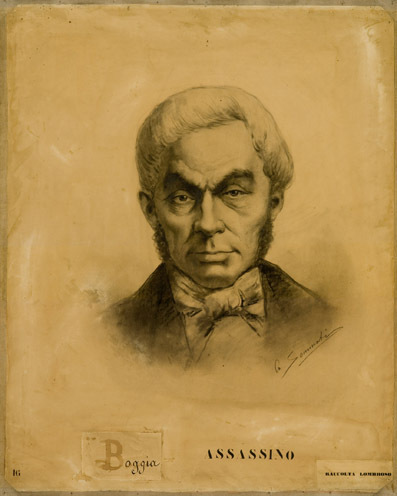 The first portraits of criminals and prisoners date back to 1871 – when the first sketches made by Frigerio were collected and compiled in an album. The album is a sort of memoir and it is a good indicator of Lombroso’s method of procedure. In fact, Lombroso used to cut out old pictures, articles from newspapers and drawings. Deformities - such as the harelip - are pointed out as peculiar characteristics belonging to famous criminals (such as Carbone, Cipriano La Gala, etc.). "Criminals are often smarter rather than skillful and combinations of the two are just as ingenious, and lack of consistency and tenacity. They just tend to reach their immediate goal, which is most often the satisfaction of material needs, they relax until new appetites push them to new business […]. Many times the extraordinary ability of some criminals is astonishing. But, on closer look, every wonder ceases to exist. They succeed so well because they often repeat the same acts over and over again. Not only the thief always remains a thief, but among thieves themselves some will only attack the shops, and of those only specific rooms. In fact, among these you have subdivisions of the vicious work10". Giuliano Eriberto Macchia (1904) had a clean record, although always with a tendency to isolation and reading novels of adventure. In 1921 he went away from the family home where he worked in order to run an errand […]. On February 24th 1922, he performed a crime in the home of Mr. Portigliatti. First, he bought in Turin a carnival mask, an electric bulb, a switchblade and left home with the last train of the day. He entered the bedroom of the Portigliattis; he hit the husband in the forehead. However, the couple reacted and fought. The wife was mortally wounded at the jugular11. 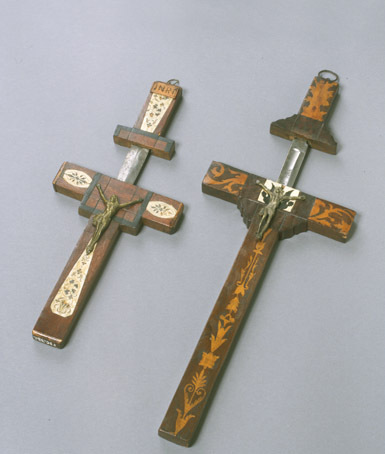 Daggers disguised as crucifixes were purchased by the Museum in 1911 at the price of 30 lire. Two of them are made up of expensive wood, while the third is in metal. They look exactly like regular crucifixes – they were used in 1863 by a group of faux-monks who killed three people and robbed other civilians. 2. Giorgio Colombo, La Scienza Infelice, op. cit., p.58. 3. Giorgio Colombo, La Scienza Infelice, op. cit., p.64. 5. Giorgio Colombo, La Scienza Infelice, op, cit., p. 85. 6. Giorgio Colombo, La Scienza Infelice, op. cit., p.175. 7. Giorgio Colombo, La Scienza Infelice, op. cit., p.181. 8. Giorgio Colombo, La Scienza Infelice, op. cit., p.195. 9. Giorgio Colombo, La Scienza Infelice, op. cit., p.153. 10. Giorgio Colombo, La Scienza Infelice, op. cit., p.141. 11. Giorgio Colombo, La Scienza Infelice, op. cit., p.143.